OAKLAND, Calif. -- The Minnesota Timberwolves essentially lost Wednesday's contest in the third quarter after giving up a whopping 44 points to the Golden State Warriors. It was an offensive display too dominant to overcome. Golden State (9-3) extended its winning streak to a Western Conference best of five games following a 125-101 win at Oracle Arena. Klay Thompson poured in 14 of his 28 points in the third. He was 6-for-12 from 3-point range. Stephen Curry flirted with a triple-double, going for 22 points, eight boards and eight assists. Draymond Green, who provided seven points, six rebounds and six assists, was asked if Curry is peaking. "I've seen crazier. However, he's been playing well," he said. "But, yeah, I've seen him do way more. Peaking? That's just ridiculous." Andrew Wiggins put in 17 points, and Karl-Anthony Towns finished with a double-double of 16 points and 12 rebounds for Minnesota (7-4). "You've got to give them credit, but I also thought we hurt ourselves," Timberwolves coach Tom Thibodeau said. "The third quarter was not our best. We'll take a good look at it, break it down and see where we can make our improvements." Kevin Durant was held out his first game of the season with a left thigh contusion. Andre Iguodala got the nod in his place. Durant told ESPN that he expects to play Saturday against the Philadelphia 76ers. "I actually kind of like these games when we have to sit somebody, in a weird way," Warriors coach Steve Kerr said. "It's good for our team. We're lucky we are in a position where we have so much talent that we can afford to miss one of our main guys and still be able to compete at a high level." Gunslinger Nick Young scored 12 points, accumulated four steals and dished out five assists. "The [five] assists got to be a career high for Nick. Peaking," Green said with a smile. Young's career high in assists is six. 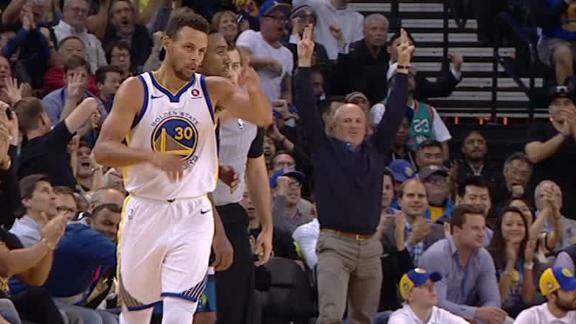 The 44 third-quarter points were a Warriors' season high for points in a quarter and the team's fourth 40-point quarter through 12 games. They were 16-of-22 from the field in the third, and 29 of their 37 assists came after three quarters. Down 19 entering the fourth, Thibodeau elected not to start any of his starters. Still facing a 19-point deficit, he reinserted three starters midway in the quarter to attempt one last push, but that push never occurred. This match marked the first time these two teams have met as divisional leaders. The field goal percentage battle went in favor of the home team, 57 percent to 41 percent. But it wasn't all good for the Warriors. They did turn the ball over 19 times, six more than their opponent. Curry took the onus for the seven first-quarter turnovers. "That was all my fault, to be honest," he said. "If the team sees me throwing the ball all over the place, trying to take too many chances early in the game then that's kind of contagious. I kind of set a bad tone in that regard." The Warriors swatted away nine shots and are now 8-3 on the season when recording seven or more blocks. They have blocked at least seven shots in 11 of their past 12 games. Golden State remains the lone team in the NBA to tally 10-plus 3-point baskets in every contest this season. They were 15-of-36 tonight. Behind Steph Curry's 22 points and Klay Thompson's 28, the Warriors best the Timberwolves 125-101 on Wednesday night. 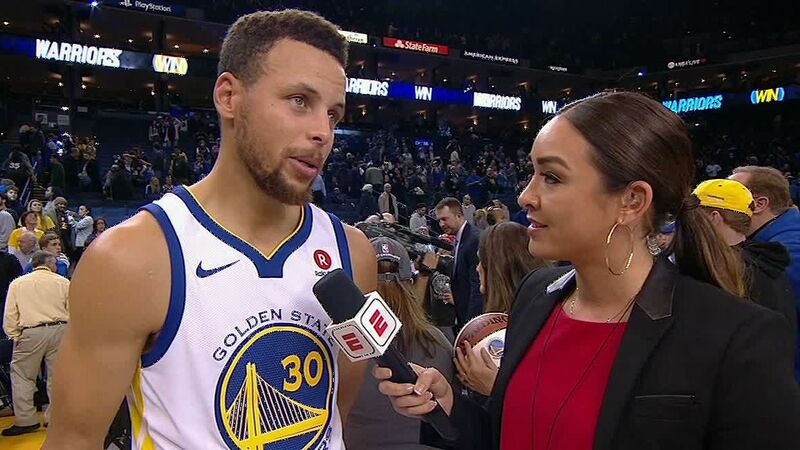 Steph Curry explains how well the Warriors are working together to start the season and how he feels about his game now that he is in his eighth season. Draymond Green blocks a shot and then on the other end, hands the ball off to Steph Curry, who knocks down a wide-open 3-pointer.